Create healthy meal plans and discover the Superfoods that can transform your plate into a passport to better health, a longer life, and a trimmer, happier you! We all know certain foods are better for us. We know that a healthy diet has less red meat, less salt, more fruits and vegetables. But what else? Are there foods that can do even more for us…foods that can offer added protection against diseases, help keep our minds sharp, our waists slim, our hearts sound, and our bones strong? The answer is “Yes!” There are superfoods …foods that can fight the diseases of aging… foods that restore energy… foods that help you look and feel better…foods that keep you healthier and living longer. In a new FREE guide from University Health News you’ll meet these superfoods. You’ll meet the standout choices among vegetables, fruits, grains, proteins, and more. And you’ll see how easy it is to incorporate these powerhouses into delicious healthy diet plans. Complete Nutrition is a handbook for healthy eating. You’ll read about those foods that are proven to reduce the risks of Alzheimer’s disease, cancer, heart disease and stroke. You’ll find a food to protect your vision, a drink that can halve your risk of cardiovascular disease, and a “sweet” way to lower blood pressure. Plus, you can win and lose at the same time! The magic of a super-food diet is that it is also a weight loss diet. As you’re boosting your wellness, you can shed pounds and slim your shape! And all with foods that are delicious, affordable, easy to find and easy to prepare. Complete Nutrition is yours absolutely free. And you can download it now! Healthy meal plans let you put away the calorie counter! Healthy meal plans emphasize nutrient-rich foods, including whole grains, fruits, vegetables, nuts, and fish. Filling your plate with nutrient-rich foods keeps your calories in check. Most vegetables provide less than 50 calories per one-half cup cooked or one-cup raw serving. A super-grain like quinoa has only 111 calories in a half cup serving. And peaches and plums are calorie bargains at about 50 calories per serving. And just as they are low calorie foods, the superfoods you’ll meet in this empowering FREE Guide are brimming with benefits…foods that will fortify your body and mind, boost your disease resistance, and add to your independence and longevity. For example, you always heard that carrots were good for your eyes. The fact is, they are. But did you know that tomatoes offer added protection against breast cancer…that asparagus can fortify the immune system…and blueberries have proven protective effects on brain health? For our full harvest of super fruits and vegetables, download your FREE Guide now. High-protein foods. Low-carb diet. Raw foods.Paleo diets. How do you sort it all out? Your FREE Guide does that for you! Confused by all the “food fights?” Diets that fixate on a handful of foods actually deprive your body of the full spectrum of vitamins, minerals, and nutrients needed to provide real disease protection. The supermarket spice that’s showing unexpected promise in preventing Alzheimer’s disease. Healthy meal plans, ones that build your protection against disease, are comprehensive and inclusive. They do not confine your choices, they refine those choices. Healthy meal plans expand your repertoire of healthy dinner ideas—while cutting wasted, empty calories. The great thing about healthy meal plans is that they are easy. There are no points to count. No rigid menus. You enjoy foods that are not overly processed, refined—or expensive. You’ll lower your risk of a host of age-related diseases—all while savoring foods that will boost your energy and your spirits. Complete Nutrition puts the preventive and health-giving powers of good food in your hands! And it’s yours to download right now-absolutely free! You’ll meet Superfoods from A(almonds) to Z(zucchini)…plus many more that will surprise, delight—and even shock you! Healthy meal plans are no longer just broccoli and bulgar. Far from it. Nutritional research experts now know that superfoods include a variety of proteins, grains, beverages, even fats, herbs, and spices. When it comes to protein, both quantity and type are important. Healthy meal plans include a healthy protein package. Fish offers protein packaged with healthful omega-3 fatty acids. Beans, along with protein, give you fiber, vitamins, minerals, and phytochemicals. A one-ounce serving of peanuts provides 7 grams of protein—the highest protein content of all types of nuts, and about the same as an ounce of meat. Plus, they have heart-healthy fat and fiber. And did you know that the number one source of antioxidants in the American diet is coffee? Good old Joe. And you gain the antioxidant benefits from decaf as well. In your FREE guide, you’ll read why bananas may be the perfect food for athletes…how a handful of red cherries can ease arthritis symptoms, and how the golden spice turmeric may brighten the prospects for successfully preventing Alzheimer’s! Superfoods make healthy meal plans a practical reality. Superfoods are the all-stars you want in your starting line-up. Does every food you eat have to be a superfood? Of course not. But by including superfoods in your daily meals you can gain years of healthier—and happier—living. You’re not making sacrifices; you’re making smart substitutions. You already know you should give up the bacon and the bagels. Start the day instead with oatmeal (great for reducing bad cholesterol) topped with blueberries, have an orange or grapefruit (for vitamin C). And don’t forget the coffee. In Complete Nutrition you’ll get ideas for every meal…from easy breakfasts to healthy desserts (with dark chocolate, of course!) …from brown-bag lunches to weekend brunches. Your FREE Guide includes tips for planning a weekly menu…for kitchen short-cuts…managing portion size…and simplifying shopping. Satisfy your “healthy” appetite—with this FREE Guide! Complete Nutrition will show you how accessible healthy diet plans are. You’ll find it’s easy it is to supercharge your diet with foods that are bursting with nutrients…foods that bring new variety to your dinner table…foods that are neither exotic or expensive…foods that can protect your health and bolster your energy. Get your copy of Complete Nutrition today. It’s yours—absolutely free! P.S. 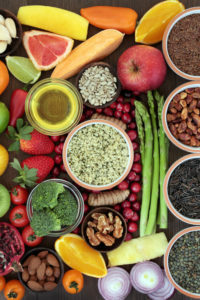 In the Free Guide you’ll also learn which cooking oil is the number-one choice for healthy diet plans…which five herbs and spices make the superfood list…and which nut is a top source of vitamin E. And want to know if that bread really is “whole grain?” The Guide will tell you what to look for. P.P.S. Does red wine really help your heart? How about other “adult” beverages? For a definitive answer see page 26 of the Guide. I have not received my guide on Complete Nutrition. I need to lower my cholesterol and high blood pressure, and loose weight. I am always hungry after eating need help to eat healthy and shed few pounds Thank you ?